As digital marketing goes mainstream, marketers need to gain the insights and confidence to apply their marketing thinking as effectively to these new environments as they do in classic media. 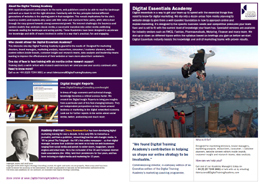 The speed of change creates a skills challenge in every firm and this Digital Essentials Academy is designed to quickly lift knowledge across a wide area of digital disciplines. This programme of digital marketing coaching includes intensive face-to-face training, with online exercises before and after, a longer term graduate programme of regular research briefings, and a Digital Classroom. The coaching is broad, covering online media, search engine marketing, websites, mobile and email, as well as how to get more from agencies.